On Easter, and for a few short weeks after that, these ducklings had everything: they were greeted with smiles and hugs by a whole family, were given as much food as they liked and plied with treats, and ended each day snuggled into a warm, soft bed. And then the kids got bored. Each spring hundreds of Easter chicks and ducklings are dumped in boxes on busy streets, in city parks, and in front of animal shelters all across the US once the demands of caring for a bird become a reality. One of these ducklings was found cold and hungry in a parking lot, and the other had been found alone, wandering the streets of New York City. If they had not been rescued and brought to the Wild Bird Fund, these little ducklings would not have survived. These ducks are domestic birds and have never foraged for their own food or learned to evade predators. Worst of all, families that buy Easter chicks rarely expose the ducks to water, so their feathers never become waterproof. If they had wandered into a pond, they would have drowned. At the Wild Bird Fund rehabilitation center in Manhattan, we slowly began to introduce them to water. At first they were only allowed in a tub just deep enough to stand in, which got them accustomed to it and encouraged them to begin preening. When birds preen, they move their feathers into position to make a water-tight shell to protect their sensitive skin underneath. It also lets them distribute a waterproof coating of oil that they produce across their feathers. Once they became accustomed to the water, the bathtub was filled just deep enough to swim in, and they took their first, cautious strokes under the watchful eye of a lifeguard. It took a week of these daily baths to get them to overcome their fear and make them completely waterproof. It was finally time to let them try the big pool. We placed the two of them on the dock leading into the water, and watched as they cautiously stepped down the ramp, nosing at the water, and then splashed in together. 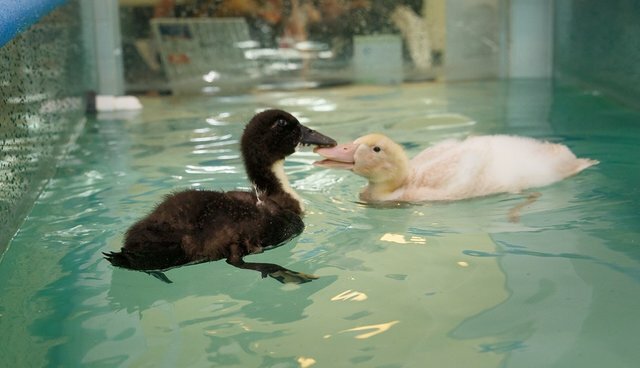 They dunked their heads under the water, flapped their wings with excitement, and quacked to each other all the while. It had taken them weeks to finally be able to do what ducks do best: simply go for a swim. Our pair of ducks was re-homed to an upstate sanctuary, where they are now living in a flock and have an outdoor space to forage in and go swimming. While our Easter ducklings have a happy ending, sadly, the majority of ducks bought this year will not. Please celebrate Easter responsibly and never purchase ducklings or chicks as gifts.